Koh Chang Modern Thai Design Beachfront Villa. This comfortable Property is located in 2,000 sqm of Chanote title land, on Koh Chang's quieter north eastern coast. The Villa has 2 large air conditioned bedrooms with dressing areas and built-in wardrobes. Both bedrooms have en-suite shower room and the master bedroom is also equipped with a bath tub. The kitchen is open plan style, overlooking the living room, has a large ceramic work top and is is well equipped with modern appliances. The living area is a good size and has a terra cotta tiled flooring. French doors which open on to open patio area on one side and the garden terrace on the other. 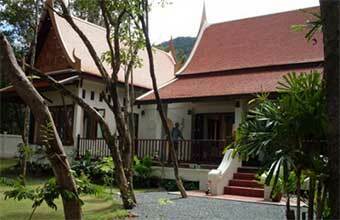 The front of the Property has a substantial well established garden with some beautiful sea views towards Trat. The beach area is mostly stony with rocky outcrops and some small patches of red sand. The rear of the Property has a wide gravel driveway with lots of parking space. There is a small 1 bedroom bungalow, currently used by the maid service.